As the specter of HIV looms in the background, Botswana’s industry of orphan-focused aid interventions reflects deep-seated anxieties about girls’ bodies, health, sexuality, and morality. As foreign NGO staff lament “patriarchal” norms that supposedly leave orphaned girls culturally and economically ill-equipped to refuse advances from older men, these organizations seek new ways to liberate orphans from underage sexual relationships. I trace how one NGO attempted to render sugar daddies unnecessary by directly giving girls the gifts a boyfriend would provide, drawing on human rights and empowerment discourses. However, many orphans began to appropriate these NGO resources in order to attract even wealthier boyfriends, aggressively pursuing age-unequal relationships using the very tools the NGO provided to fight them. 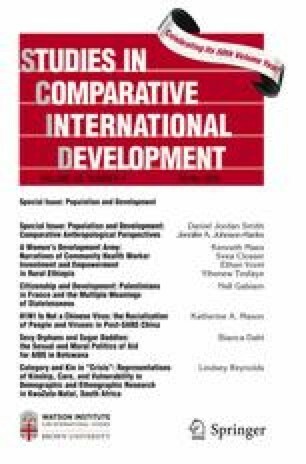 While tales of failed intervention are commonly represented in development studies as evidence of either “culture clash” between foreign aid and local customs, or as the “unintended consequences” of aid, this article argues that such explanations fail to address the competing and coalescing moralities that motivated the girls’ behavior. By recognizing their actions as efforts to manipulate multiple moral codes that are at play during the HIV epidemic, I suggest that we may reach a better grasp of the inner lives of aid’s targets and gain fresh perspectives on the intimate sociopolitical effects of intervention. For their helpful comments on earlier drafts of this paper, I would like to thank participants in the Workshop on Anthropology and Population convened through the Population Association of America in 2014, and participants in the Workshop on International Intervention at McMaster University in 2013, funded by the Wenner-Gren Foundation. The paper also benefitted from feedback by Ellen Block, Jennifer Cole, Paja Faudree, Andrew Gilbert, Jesse Grayman, Saida Hodzic, Jennifer Johnson-Hanks, Jessaca Leinaweaver, Ramah McKay, Becky Schulthies, Daniel Jordan Smith, Rania Sweis, Miriam Ticktin, and two anonymous reviewers. The research was generously supported by grants from the Social Science Research Council, Fulbright-Hays and the U.S. Department of Education, the Wenner-Gren Foundation for Anthropological Research, and the National Science Foundation. UNAIDS. Progress report of the national response to the 2001 declaration of commitment on HIV and AIDS: Botswana country report. Gaborone: National AIDS Coordinating Agency. Online publication: http://data.unaids.org/pub/Report/2010/botswana_2010_country_progress_report_en.pdf (2010).